Ukrainian film director Oleh Sentsov, who is serving a prison sentence in Russia, is in a relatively stable condition; the second wave of crisis has not started, and he is getting through with vitamins and glucose, his lawyer Dmitry Dinze said. 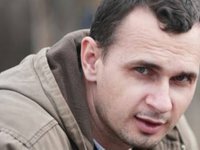 Sentsov was visited by his cousin Natalia Kaplan; the meeting lasted for about two hours and focused mainly on everyday topics, Dinze told 112.Ukraine television channel on Thursday. "Before that Oleh did not want to see any of his relatives... and did not ask to be visited, telling [them] not to come," Dinze said. Yet when it was time for a brief visit, Sentsov decided to talk to his relatives and asked his sister to come over. When asked about Sentsov's health the lawyer said that according to the cousin: "He looks just as pale..., concerned by too much hassle around his personal life." For now Sentsov is "getting by on vitamins and glucose" and his condition fluctuates between normal and bad, Dinze said. "He is not fainting from hunger, there is not a second crisis... the condition is stable, if one can say so. A second crisis could begin at any time. If it does, there will be feeding, but for now he is getting through on vitamins and glucose," the lawyer said. Speaking of Sentsov's meeting with the Russian ombudsman Tatyana Moskalkova, Dinze said that the meeting was very brief with the two discussing neither a possible exchange nor its negotiation. Sentsov is held at the White Bear prison behind the polar circle in Russia's Yamal-Nenets Autonomous District. He was arrested in Crimea in 2014 and in August 2015 sentenced by North Caucasus District Military Court to 20 years of imprisonment at a maximum-security facility. On May 14, 2018 Sentsov announced a hunger strike to demand the release of all Ukrainians imprisoned in Russia.